The Partnership extends a warm thank you to all who attended the 2019 Management and Leadership Training Conference (MLTC), which took place from January 16-18, 2019, in New Orleans, LA at the Westin New Orleans Canal Place. A special thanks to our local host, Total Community Action for providing conference support and local detail that made this year’s event so successful and memorable. To view conference materials, see below or click here to view conference presentations. 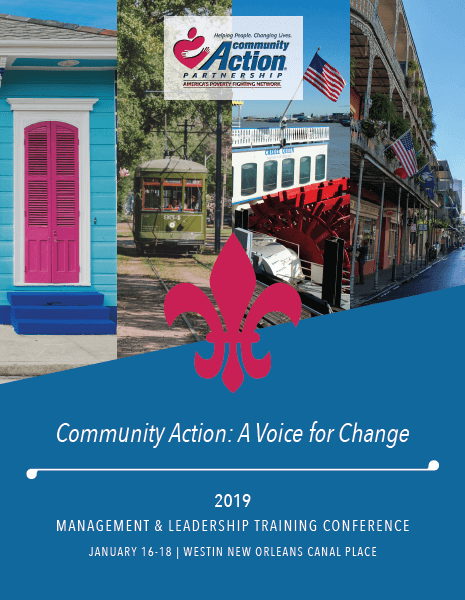 The Program Book is a comprehensive guide for all workshops, activities, and gatherings that happened at the 2019 Management and Leadership Training Conference in New Orleans, LA. Complete with session descriptions, speakers, schedule, hotel map and more. Click here to download the 2019 MLTC Program Book. 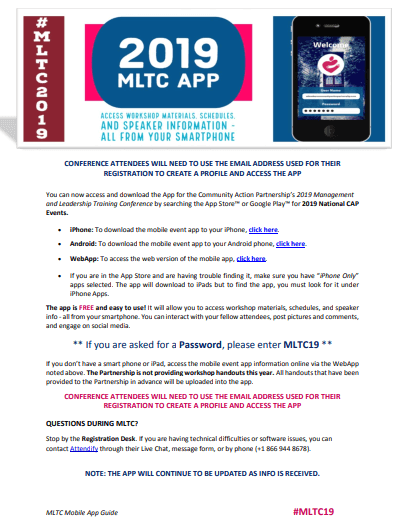 Access and download the MLTC App by searching the App Store or Google Play for “2019 National CAP Events,” then enter the passcode “MLTC19.” The App is free and easy to use. Access workshop materials, schedules, and speaker information — all from your smart phone! Click here to download the Mobile Event App Guide.